Albert Gonzalez Farran/Demotix. All rights reserved. The US Special Envoy, Donald Booth, will be given a warm welcome when he visits Sudan at the end of July. Khartoum’s hard-line Islamist regime anticipates the normalisation of relations with America, and the end of sanctions imposed by Bill Clinton in 1997, following Sudan’s role in bombing US embassies in Kenya and Tanzania. Five years ago Sudan’s President, Omar Bashir, was indicted for the crime of genocide against his own citizens in Darfur. However, Washington justifies this diplomatic thaw by claiming Sudan is no longer harbouring terrorists. What can explain this myopia, when US security services know Sudan has been facilitating ISIS in Libya, Syria and Iraq, and sundry other terror groups? Khartoum’s ruling elite has supported terror for decades, giving Bin Laden sanctuary, supplying weapons to the rebels currently doing their utmost to destroy South Sudan, the Central African Republic, Syria and Iraq, and Libya, not to mention sheltering Joseph Kony’s Lord’s Resistance Army—according to Ugandan intelligence. In the face of US inaction, Israel has three times recently bombed arms convoys going through Sudan, carrying Iranian weapons to Hamas. Khartoum makes Iranian weapons under licence, and has had military partnerships with Tehran for years, with whom they share a fundamentalist ideology. Like Iran, Sudan is committed to spreading Islamism by force. For the sake of appearances Khartoum is obliging its Saudi creditors by joining its onslaught on the Iranian-backed Houthis in Yemen, but its deep relationship with Tehran endures. At home in Sudan, this bleak ideology finds expression in the ethnic cleansing of anyone who does not fit the regime’s narrow view of Islamic or Arab identity. An estimated one and a half million people have been killed in its non-Arab, non-Muslim southern states (now South Sudan). In Darfur, South Kordofan and Blue Nile the regime-sponsored bloodshed is back at devastating levels, albeit in a media vacuum since the regime makes it almost impossible to access these vast areas of suffering. Washington insiders suggest Sudan cleverly drip-feeds the US morsels of intelligence of questionable value. The career of a State Department or CIA functionary may rest on whether or not they followed up every lead, in case it results in a terror attack on the USA. For instance, Khartoum might hint it has information about an Al Qaeda bank account, and after six months coaxing from the US, it might divulge the details of an inactive account with $100 in it. There is no proof anything useful has ever been revealed by the Sudanese, but in the absence of a greater appreciation of Sudan’s end-game, and without sufficient knowledge of Sudan’s track record, staffers ignore leads at their peril. Moreover, Khartoum does not represent a direct threat to American life. Evidently it is irrelevant that the International Criminal Court indicted Sudan’s President, Field Marshall Omar al-Bashir, for the crime of genocide five years ago. Threats to Sudan's neighbours, or its long-suffering citizens, are of no consequence. US foreign policy priorities are stopping Iran acquiring nuclear weapons, and containing ISIS. So why is the US turning a blind eye to Sudan’s links with ISIS and other terror groups? President Obama’s previous special envoy, Princeton Lyman, believed regime change in Sudan was unnecessary because the Khartoum elite would reform itself. If so, it would be the first genocidal government in history to do so, according to the former UN chief in Darfur, Mukesh Kapila. In all other cases, only force has dislodged leaders who systematically slaughter their people, Kapila points out. Lyman’s predecessor, Scott Gration, thought he could influence Sudan’s leaders by treating them like children, “handing out cookies or gold stars” for good behaviour. America can and should be better than this. US citizens may be unaware of the democratic governments overthrown in their name or the monstrous regimes America has propped up. But the citizens of those countries are not so ahistoric, and in the absence of development and hope, their grievances fester. In the long run, Americans may pay the price. There is another way to avoid putting US boots on the ground. In the case of Sudan, many provisions of United Nations Security Council resolutions have yet to be implemented. 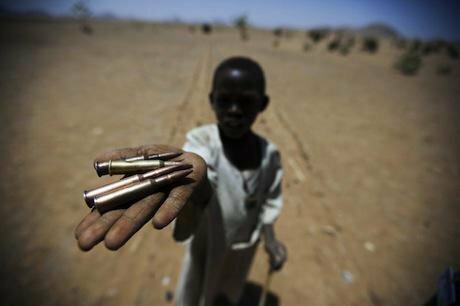 For instance, the UN voted to apply smart sanctions, targeting the architects of the genocide in Darfur. We know that when sanctions are personal, hitting the ruling elite rather than citizens, they have an effect. We should freeze the finances of Sudan’s bloated rulers, and impose a travel ban, preventing their frequent shopping trips to Paris, and their visits to London clinics. Although these measures were approved, they have never been enacted. America tells the world it is both exceptional and essential. Yet, US foreign policy in practice is no more principled than the cynical old Realpolitik of European diplomacy. Forget the high moral tone about human rights, freedom and democracy; America is just as calculating as the former colonial rulers-turned-arms-salesmen in France and Britain. So long as American lives are not under immediate threat, it selectively turns a blind eye to governments that crush dissent at home, ethnically cleanse their minorities, or support terrorism. Yet, recent history in Afghanistan and the Middle East teaches us our short-term allies may quickly become our enemies. Surely we must look more critically at regimes offering us warm words and smiles, while facilitating the spread of hate ideology and terrorism.